This is a fantastic recipe from Julia Child. 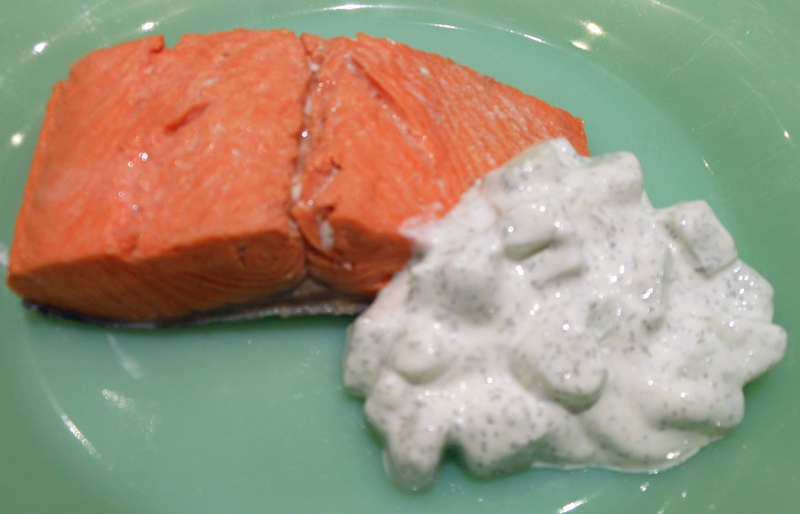 Cook 8 minutes for salmon that is 1/2″ thick. Fish is done when the flesh has turned from translucent to opaque and, rather than feeling squashy to the touch like raw fish, it feels lightly springy. It should still be juicy. Fish that is resistant and flaky is overdone. When removing fillets from the water, use a slotted spatula and blot on a paper towel before serving on a warm plate. Serve with Cucumber Sauce. Peel the cucumber and halve it lengthwise; scoop out the seeds with a teaspoon. Cut the halves into quarters and the quarters into crosswise pieces 2 inches long. Finally cut the quarters into matchstick julienne, stack the julienne, and cut into dice. Toss the cucumber in a bowl with the salt, sugar, and vinegar. Let stand 5 minutes or so, then fold in the sour cream. Season carefully to taste, and fold in the dill.